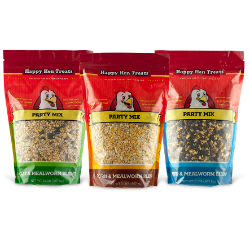 Get the party started and keep your chickens happy when you open up a bag of Party Mix from Happy Hen Treats. Each mix has high quality ingredients. Feed straight from your hand, scattered on the ground, or in a feeding dish as a treat only. Perfect for training or taming chickens or just giving them a special treat. Choose from: Sunflower & Raisin, Mealworm & Corn, or Mealworm & Oats.